How accurate is the Rogue\'s EPA mpg rating? I currently have a 2009 Forester that averages about 24 mpg and am looking for a more fuel efficient vehicle, so visited our local Nissan dealership yesterday while looking for new cars. The dealer told me that the Rogue actually gets better mpg than advertised, and said that many of the vehicles coming in for service average closer to 32-36 mpg, with some as high as 39 mpg, despite the vehicle being listed as 26/33/29. The sales person said this was due to the car learning driving patterns and AWD vehicles having intuitive AWD that does not activate all four wheels at all times the way Subaru\'s symmetrical AWD system does. Have other drivers experienced 30+mpg average or is this sales person just trying to sell me a car? We were looking at new vehicles so 2017.5 and 2018 models. The dealership is in town and I live in northern New England in an area with plenty of hills. Even the "city" has very little stop and go traffic, so I while I imagine many users are putting more "highway miles" on their cars I would still think that the hills, dirt roads, and cold weather would impact fuel economy so that most drivers experienced fairly average results. These are real people getting real-world MPGs. Typical car salesman. I think he's lying. 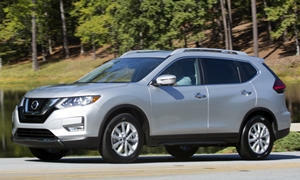 The Rogue is not competitive compared to most other compact CUVs. I'd get the Forester over the Rogue.